First, we want to welcome Major League Soccer (MLS) to the SponsorPitch movement! As of this week, the league is embracing the opportunity to get all of its league and team sales and marketing staff on SponsorPitch with Professional memberships. MLS is the first major sports league to ensure that front office staff at all 19 teams throughout North America will be maintaining SponsorPitch profiles, reporting the deals they have done/brands worked with and getting full access to SponsorPitch's suite of groundbreaking research tools for professional members. Keep an eye out as MLS sales and marketing execs join the SponsorPitch network from your local market and don't hesitate to network with them, start swapping insights and doing all the stuff you're already doing to make the SponsorPitch network the #1 online resource for sponsorship professionals. We applaud MLS for taking this step to make sure their team staffs have the latest cutting edge tools at their full disposal. 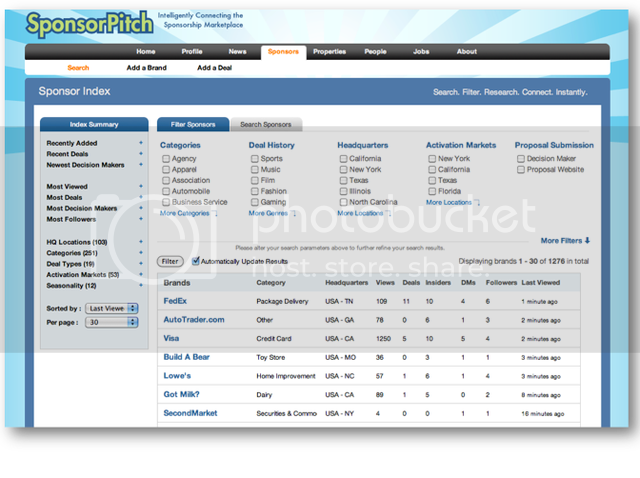 Search and filter the entire sponsors database, which as of this post stands at 1,275 actively spending sponsors, by several different search variables such as location, category, proposal submission options and more. As the President of one of the world’s largest endurance events recently said after seeing a demo earlier in the week, “this is like a global online phone book for sponsorship.” We're not going to turn down a compliment, but the truth is it is a lot more than that and we hope you will take some time to go check it out for yourself. Finally, we've introduced new professional pricing plans to make all of this more accessible and affordable for you. You can go month-to-month or if you want the lowest price, try our annual professional membership at a 30% discount to the monthly rate. As always, SponsorPitch is free to join. You’ll be hearing more about SponsorPitch as we accelerate our efforts to enhance the network and unleash an unprecedented new level of professional efficiency in the sponsorship marketplace, but we wanted you to be among the first to know about some of the latest developments.